WELCOME to Kitty Hawk Elementary School, a North Carolina School of Distinction. With over 60 years of rich history, Kitty Hawk Elementary School continues to provide a quality education for all students. By linking the North Carolina Standard Course of Study to 21st Century Learning Skills, we help students learn what they will need to be successful in the future. We are proud of our tradition that provides a relevant and rigorous curriculum in a positive learning environment for students at all levels. Our expectations are high, and our students and parents understand that we will work together and do whatever it takes to meet the needs of every student. 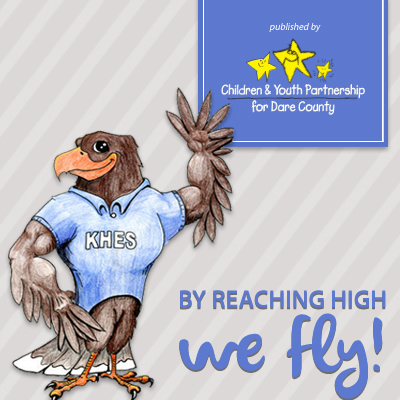 At Kitty Hawk Elementary School, our school motto is “By reaching high, we fly.” Our faculty and staff subscribe to a philosophy of reflective thinking that leads toward continuous improvement. We believe that relationships are important, and our staff works proactively to build an atmosphere of mutual respect that promotes learning.